Formula One: Hamilton takes title lead after Rosberg retirement! Home » Formula One: Hamilton takes title lead after Rosberg retirement! 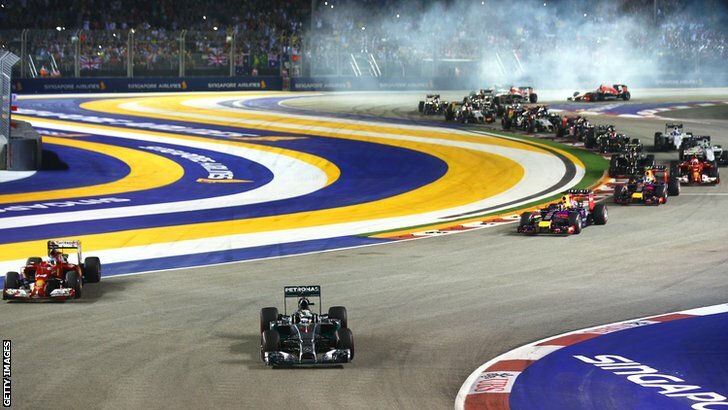 Lewis Hamilton has won the 2014 Singapore Grand Prix after a tense race at the Marina Bay street circuit. Title rival and team-mate Nico Rosberg was hampered by issues from the start before retiring after his first pit-stop. With Hamilton taking his 7th win of the year, he has now taken the title lead by 3 points heading into the next round in Japan. Sebastian Vettel got his 2nd podium of the year in 2nd place, with team-mate Daniel Ricciardo taking 3rd. The drama had begun in Singapore even before the formation lap had started. Nico Rosberg was suffering from electrical issues with his steering wheel and had changed it multiple times. He failed to get away when the formation lap started, which meant that he would have to start from the pit-lane instead of from 2nd place. Lewis Hamilton got a perfect start from P1 on the grid and led into turn 1 comfortably. Ricciardo had a worse start and was sandwiched between Vettel and Alonso as they approached the braking zone. Fernando went into the corner way too fast and had to cut across turn 1 and 2. He had rejoined in 2nd place, but he gave Vettel the place due to the unfair advantage. Kevin Magnussen made a fantastic start from 9th on the grid, but after a brief battle with team-mate Button, he was forced back down to his starting position. Nico Rosberg had managed to get going from the pit-lane and was on the back of Max Chilton. Normally it would’ve been easy for Rosberg to pass the Marussia, but not today! The Mercedes driver had to remain behind the Briton until lap 5. Then he got stuck behind the Caterham of Marcus Ericsson. Rosberg’s car was clearly still struggling: He had to shift up two gears at a time due to the hardware issue on his car and as a result was 5 seconds a lap slower than team-mate Lewis Hamilton. To add insult to injury, he was then informed that he had lost his pit-limiter and would have to keep the car below 6,000 revs to ensure that he wouldn’t speed when he came in for his stop. Adrian Sutil kicked off the first pit-stop phase on lap 10 when he pitted for Sauber. Felipe Massa and Daniil Kvyat would follow him in soon after, with the latter emerging just behind Rosberg’s slow Silver Arrow. It would take just one corner for the Russian to get by. Vettel, Alonso and Ricciardo all pitted at the same time on lap 13, with Red Bull expertly double-stopping their two drivers. Hamilton followed them in on the next lap and re-joined in the lead after a smooth stop from the Mercedes mechanics. It would be a stark contrast when Nico Rosberg pitted on the next lap. His issues that prevented him from starting on the grid had stayed with him as he made his pit-stop. He had to stall his car as he approached his pit box as he was unable to select neutral. The team restarted the car after changing the tyres, but now he was unable to shift up into 1st. 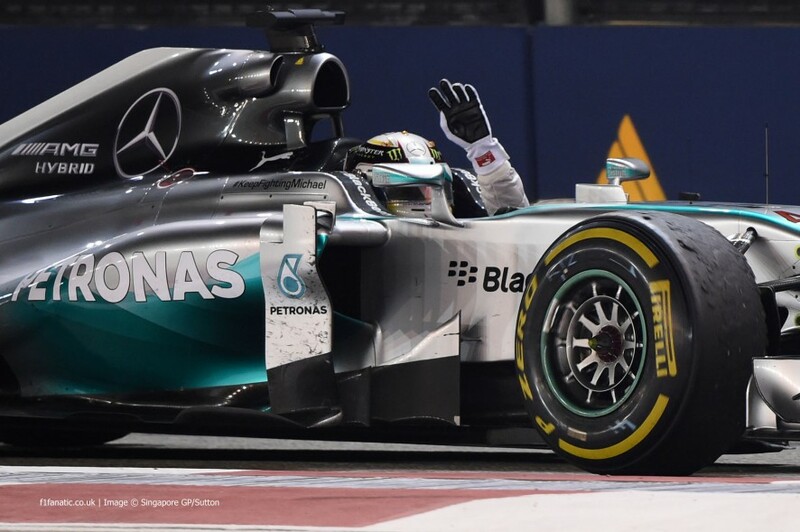 After a minute of desperately trying to get going, Rosberg waved his arms in the air as the team parked the car. The championship leader was out of the race for the second time this year. Ferrari had seemed a lot quicker in Singapore compared to previous races. This was showing in the 2nd stint of the race with Fernando Alonso. Fernando had emerged from his pit-stop around 3 seconds behind 2nd placed Sebastian Vettel. A few fastest laps later bought the Spaniard to just over 1.5 seconds adrift. The Ferrari driver decided to pit for a second time on lap 24. He made a super in lap, the team serviced him quickly and efficiently and he made a great out-lap on the new super-soft tyres. This perfect few laps ensured that when Vettel pitted a lap later, he had been well and truly undercutted as Alonso powered past into 2nd place. Alonso’s pace was so good, that by the time race-leader Lewis Hamilton had pitted, the Briton’s once 9.2 second lead had been decimated to just over 3 seconds. Any hint of a challenge was halted soon after however, when Hamilton set a new fastest lap of the race to re-extend his advantage to 5.2 seconds. This lead wouldn’t get any bigger however, as on lap 31, Adrian Sutil squeezed Sergio Perez into the wall, causing the Force India’s front wing to shatter into many pieces of razor sharp carbon fibre. 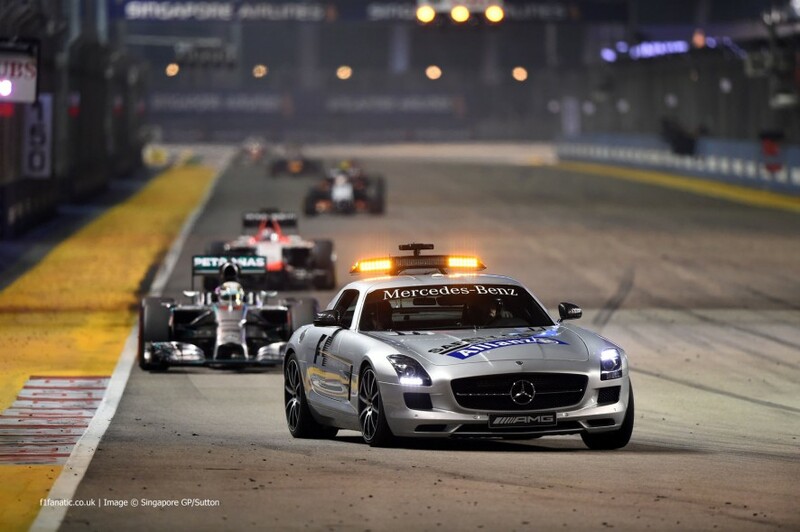 With the race track covered in debris, the safety car was called out. Hamilton, Vettel and Ricciardo all decided not to pit under the safety car, but Alonso did. Despite having only been on his super soft tyres for a matter of laps, the Ferrari driver fitted a set of the soft compound tyre to his car in a bid to make it to the end without pitting. With an extended safety car period to ensure all the debris was removed, coupled with the few extra laps whilst the lapped cars were waved through to unlap themselves, a number of drivers were now set to try and make it to the end on their current set of tyres. These included Vettel, Ricciardo and Alonso in 2nd, 3rd and 4th, but not Lewis Hamilton! The Mercedes team had not fitted the soft tyres to Hamilton’s car and as a result would have to make a mandatory pit-stop at some point in the final 24 laps. Hamilton blasted away from the restart as he sought to build as much of a gap as possible to Vettel in 2nd. He would need around 27 seconds in order to re-emerge in the lead of the race after a pit-stop. He made an excellent start to this vital stint by pulling out a 3 second lead by the end of the restart lap. With just under 20 laps to go, he had a 10 second lead, but would need much more. His engineer told him that they needed to get 7 more laps on his current tyres, which was met with scepticism from the 2008 champion. Vettel was starting to doubt whether he could make it to the end as well, but was told that he would have to find away as that was what Ricciardo and Alonso were doing behind him. The battle for the top 4 positions really started to ramp up as Alonso closed in on the two Red Bulls, whilst Hamilton continued to push as hard as he can before he made his last stop. 15 laps to go and Hamilton was leading by 18 seconds. 3 laps later his lead was 21 seconds. 2 more laps later and he was 25 seconds in the lead! His pace was electric, but his tyres were starting to wear. The next few laps saw Lewis starting to get more and more anxious over the possibility of his tyres falling off the cliff or exploding, but the team kept him out because somehow he was still gaining an advantage. Hamilton finally pitted on lap 52 of 61. He needed the perfect stop to minimise the work he would need to do in the final few laps of the race. The team delivered a good stop, but it wasn’t enough to get him back out in the lead. He emerged 1.6 behind Sebastian Vettel in the lead, but crucially just ahead of Daniel Ricciardo. This meant that Ricciardo would be unable to act as a rear-gunner for Vettel by holding Hamilton up. Hamilton’s new tyres were more than a match for all of the cars around him, who had been on the same set of tyres for over 20 laps by the end of the race. As a result, Hamilton cruised up to the back of race-leader Sebastian Vettel in a few corners. He got in the DRS zone of the Red Bull on the run out of turn 4, re-taking the lead before they even reached the braking zone. He then subsequently pulled out over 6 seconds on Sebastian and was untroubled for the rest of the race. The race was switched to a time-limited finish as the two hour time limit expired. It would only subtract one lap from the race distance however. Lewis Hamilton crossed the line after just over 2 hours to take his 7th win of the year; a crucial victory after the retirement of title-rival and team-mate Nico Rosberg. This meant that he would now lead the driver’s championship for the first time since the Spanish Grand Prix in May. The final few laps saw a tense battle between 2nd, 3rd and 4th place. 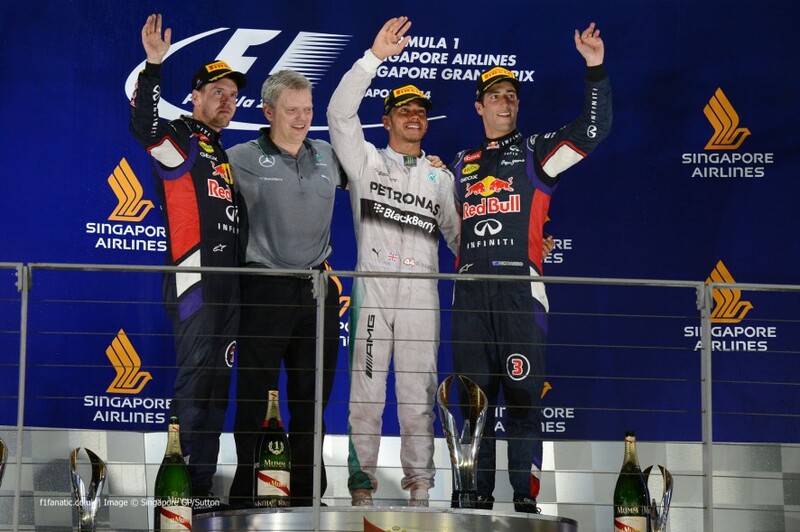 Somehow Sebastian Vettel and Daniel Ricciardo managed to hold onto the final podium positions, with Fernando Alonso unable to reach the firework-lit podium for a 5th time. Former team-mate Felipe Massa pitted once more than those ahead of him, but maintained after the race that he would have finished 5th either way. Jean-Eric Vergne had a troubled middle stint in the race after earning himself a 5 second penalty that would be added to his eventual finishing position. He had entered the final three laps in 9th place, at the rear of a traffic jam behind Bottas in 6th. The Frenchman picked off Hulkenberg, Raikkonen and then Bottas, before storming ahead on the final lap to come home far enough ahead to take a career best 6th place; a well deserved finish for the man who is searching for a drive next year after being replaced by teenager Max Verstappen. Valtteri Bottas had been running in the points on the final lap in 7th place, but he would end the day with no points at all after not just hitting the cliff, but plummeting off of it. He went straight on with just 4 corners to go and lost 4 positions to fall down into 11th place. Sergio Perez, Kimi Raikkonen, Nico Hulkenberg and Kevin Magnussen would benefit as a result as they completed the final 4 positions in the top 10. 5 drivers failed to finish the race. Jenson Button had been running in the top 10 for McLaren in the final stages of the race before retiring after a total shut-down of his car. Adrian Sutil and Esteban Gutierrez also joined him in the Sauber cars, with the latter throwing his gloves in disgust after being denied the chance to earn the Swiss teams first points of the season. Nico Rosberg and Kamui Kobayashi were the last two retirements, with Kamui retiring before the race had even begun on the formation lap. Retirements: Jenson Button, Adrian Sutil, Esteban Gutierrez, Nico Rosberg and Kamui Kobayashi. Daniel Ricciardo, 3rd place: “I could see after the restart for the safety car, he [Alonso] wasn’t attacking as much as I thought with a new set of primes, so I thought he was holding back and was going to make a late charge at the end. I think we all just piled up. I caught the back of Sebastian, he caught the back of me and we were all in a train and not really any real opportunities arose for any of us.